Recent Cannes Jury prize-winning director Xavier Dolan stated in an interview yesterday that he would like to work with both Meryl and Kate Winslet. Dolan's newest film, Mommy, was just awarded the Jury Prize (essentially third place) at the Cannes Film Festival. At only 25, the Quebec native obviously shows enormous skill and promise, having already directed a handful of critically-acclaimed films. He also writes the screenplays for his movies, which tend to feature fantastically complex and interesting women. As his English-language film debut approaches, it's exciting to consider the prospect of Streep being involved. Dolan is the second director in the past week to be quoted as saying he'd like to work with Streep, coming off of Joel Hopkins's comments about teaming Meryl with Emma Thompson. A little over a year ago Quentin Tarantino expressed similar wishes (which I doubt will ever happen considering his affinity for gratuitous gun violence). With Jonathan Demme helming Ricki and the Flash later this year, are we going to see a string of films from Streep under the eye of some very notable directors? Yes, please. I imagine we'll see another trailer from this relatively soon, as it's fewer than three months away. And is anyone else wondering when the hell a trailer for Into the Woods will be released?! It would really be strange to me that not even a teaser would be ready to screen before Maleficent premieres next week, as it seems the perfect opportunity for exposure, as they're both Disney. Alas, no word yet. "I've got something going. Which again, is for Emma (Thompson). My hope is to find a good reason to put Emma and Meryl Streep in a movie together. That's my goal. That's sort of my starting point, but I'm sort of working on something ideally. Meryl doesn't know this yet, but I've mentioned it to Emma and I'm just starting to get into it. I want to try to find a way for them to have a go at each other...just have to find a plot somewhere. I joke, but you've got to start somewhere...and I find that quite interesting thinking of actors I would like to see together." Joel, I couldn't agree more. Although Meryl and Emma have worked together in Angels in America, they've never shared the screen in a feature film. This would be a fantastic pairing, along the same line of me wanting Streep to join Kathy Bates in a Susan B. Anthony/Elizabeth Cady Stanton biopic or Susan Sarandon in Best Actress. Make this one happen, Mr. Hopkins. With eight reviews on Rotten Tomatoes, the "freshness" is down to 63%. Even though its very early, by the feedback its getting thus far, I think a final score in the high 60s or low 70s seems likely. As the Cannes Film Festival is underway, a new clip of The Homesman has been released, this time including our girl. This may actually be the bulk of her scene, as in the book it wasn't much more than this. I have a feeling however that they may have expanded it just a bit to possibly include a more extended dialogue between Streep and Jones's characters. I think Meryl is doing some kind of accent here as well, but I don't really know how people sounded in southern Iowa in the 19th century. I believe the majority of that area was settled by people from Pennsylvania, so I'm not really sure what to call it, but some may say it's a "Central Plains Midwestern Accent" today. Regardless, she does a great job overall in this scene. Looking forward to getting a few reviews for this film. 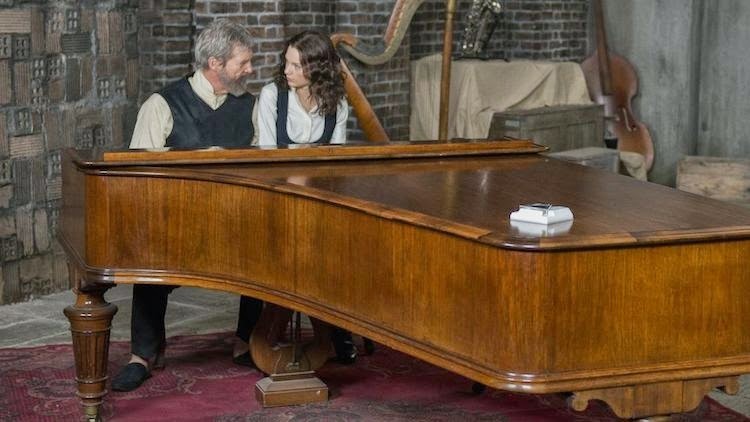 The other day a few new production stills from Meryl's upcoming film The Giver were released. Of course none included Meryl, but it's still fun to see new pics. As you can see from the subtitles, this clip was released in France for the film's upcoming in Cannes. No U.S. distributor yet, but that's likely a matter of time. 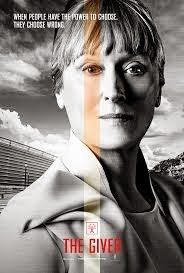 Among other sources, Variety is reporting that TriStar has set the release date for Meryl's upcoming film Ricki and the Flash for June 26, 2015. This is similar territory to The Devil Wears Prada in 2006, so it's understandable why the powers that be chose it. Of course, filming hasn't even begun, but it's likely happening early fall. Considering that Ricki is being released in June next year (not typically prime Oscar territory, but again remember Bridges of Madison County, Prada and Julie & Julia), I wonder if maybe The Good House will shoot shortly afterward. If Ricki somehow started in early or mid summer, it's not unrealistic for another film to start in October, for example. I picture The Good House as more typical Oscar fodder, so a fourth quarter release seems more likely. Perhaps we'll get two powerhouse lead performances from Streep onscreen next year. "Choose which baby to save and throw the other in this garbage can." "Now take that roasted chicken in your hands and feed it to Stanley Tucci." "Not you Margaret Thatcher, YOU'RE DEAD!" "Anne Hathaway is still giving her goddamn Golden Globes speech from two years ago." "How many inside jokes does Anne Hathaway think she has with Meryl Streep that Meryl is not aware of?"